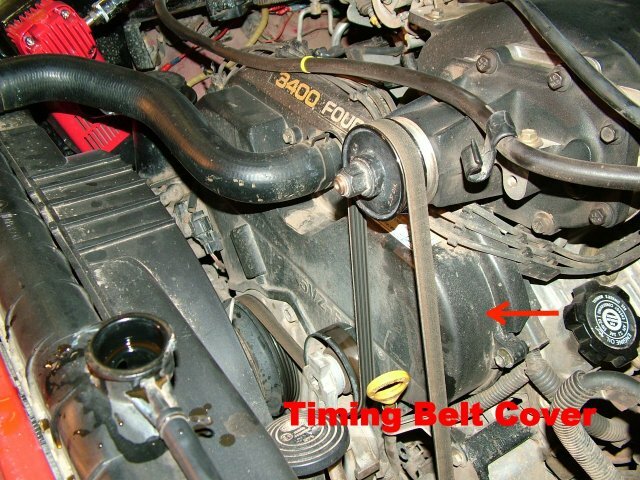 The timing belt found in 1st generation Tacomas, 3rd generation 4Runners, and T-100 Pickups require periodic replacement. From what I understand, belts on earlier models need to be replaced at 60,000 miles, and newer models at 90,000 miles. The purpose of this article is to point out the many steps that may be omitted in a routine belt change, and to show the use of an aftermarket service tool made by SnapOn and other companies. It follows the format of the Factory Service Manual (FSM), but I can't guarantee it's applicability for your particular vehicle or model year. Even though I haven't performed this service myself, I was fortunate to observe one of our readers performing it on his 1999 supercharged Tacoma. Also known as the factory skid plate. From the radiator drain valve. 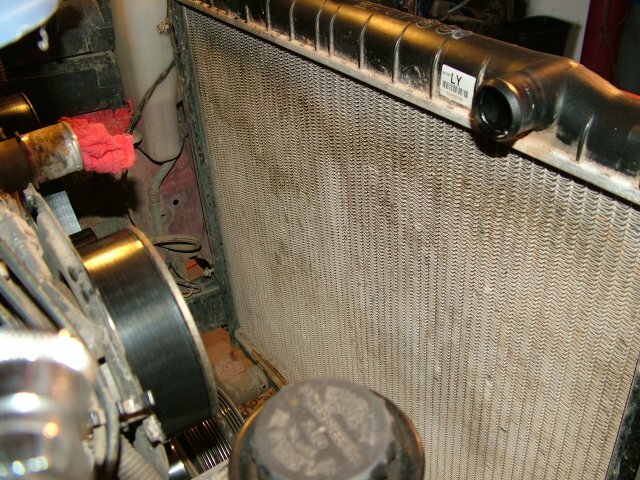 Of course, make sure the radiator is cool to the touch before draining! Also remove the radiator cap. Actually, completely remove the upper hose. 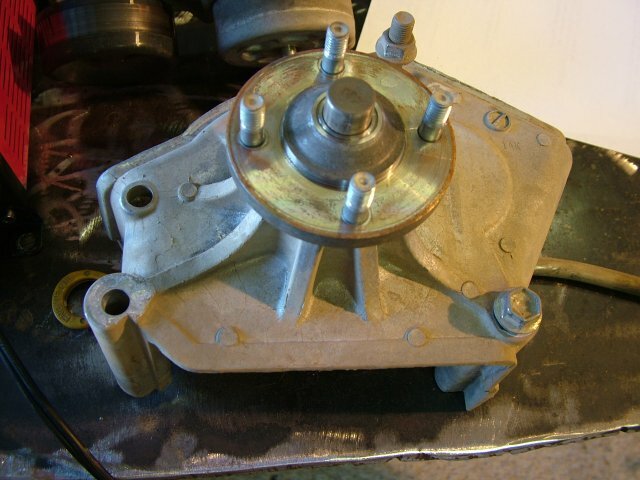 If you plan on replacing the water pump, you might as well remove the lower hose from the thermostat housing also. 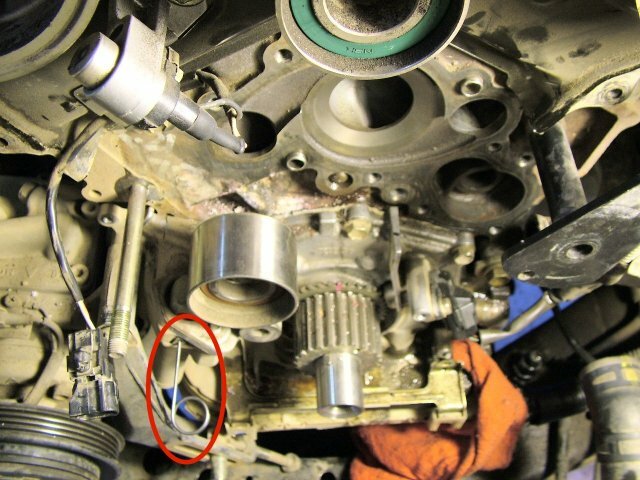 At this point the FSM instructs you to disconnect two power steering (PS) hoses from the air intake chamber, and to remove the bolt holding the PS pressure tube clamp to the frame. We didn't perform either of these two steps. Next, remove the PS drive belt by first loosening the adjuster clamp nut, then backing off the adjuster itself. Once it's loose, go ahead and unbolt the adjuster bracket from the water pump housing, and move the pump away from the engine. 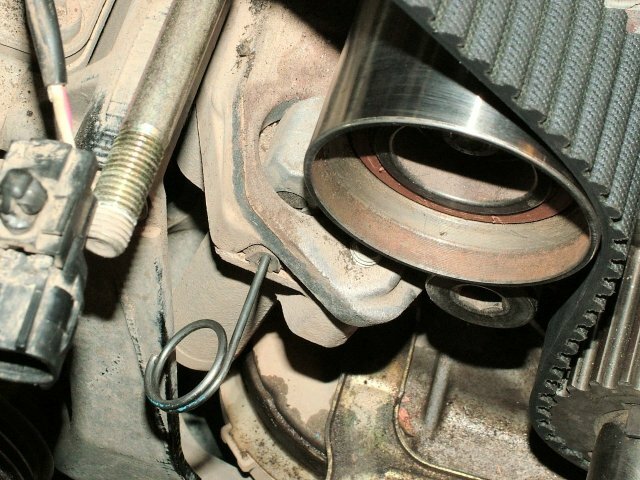 From underneath the vehicle, loosen the adjuster clamp nut, then the adjuster, until the drive belt is slack. In this step the FSM has you remove the A/C compressor. 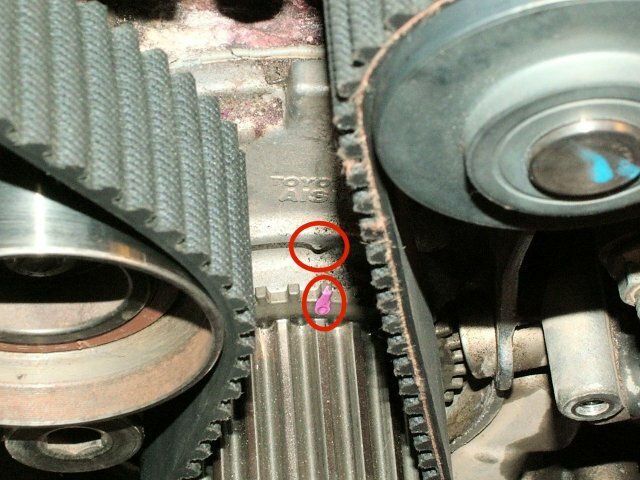 The reason for the removal is to gain access to the timing belt tensioner. By using the special Snap-On tool, we'll avoid having to unbolt the compressor from the engine. If the fan pulley wants to rotate while you try to loosen the nuts, the shank of a screwdriver may be wedged between two studs to hold the pulley. The fan shroud is two pieces. The bottom section is held on with two clips. Instead of separating the two pieces, remove the fan first, then just remove four bolts and take out the whole shroud. We did this step out of order so the whole shroud could be removed for better clearance to work. This is another step we can omit by using the Snap-On tool. 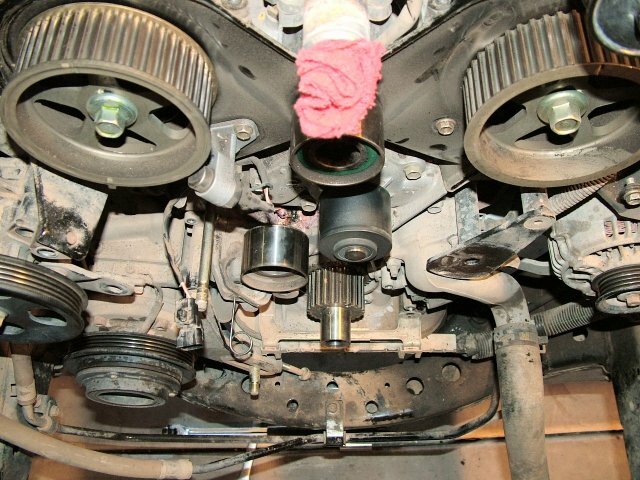 In the FSM, the A/C has to be unbolted to allow the timing belt tensioner to be removed. Once removed, the tensioner then has to be compressed in a vise, pinned in the compressed state, and re-installed that way. 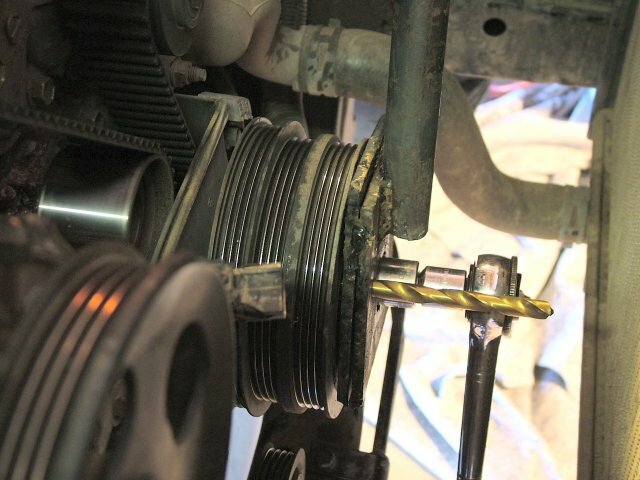 With the special tool, the timing belt tensioner can be compressed right on the vehicle, without unbolting the A/C or trying to use a vise to compress it. Remove the bolt, oil dipstick, dipstick tube, and the o-ring. Block the hole from the dipstick tube so coolant doesn't get into the crankcase if you are replacing the water pump. Disconnect four spark plug wire clamps from the top of the cover. Remove six bolts around the cover. Disconnect the camshaft position sensor connector by pinching the locking tab. Then twist the connector to release it from the cover. 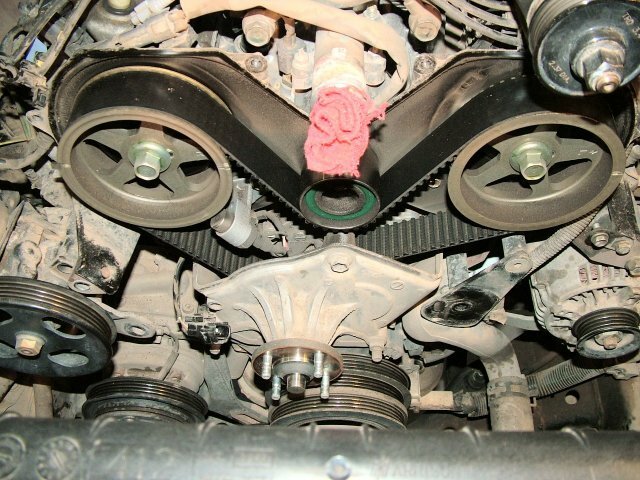 After the timing belt cover is removed, inspect below and behind the camshaft timing pulleys for any leakage from the seals. You want to discover this before going any further, since their replacement is beyond the scope of this article. This is rare, but the possibility should not be overlooked. Remember to also inspect the idler and tensioner pulleys for any leakage or worn bearings as components are removed in the steps that follow. The view after Step 8. After Step 12. The fan 'bracket'. The water pump was leaking. It really is just a bracket, the water pump is behind it. 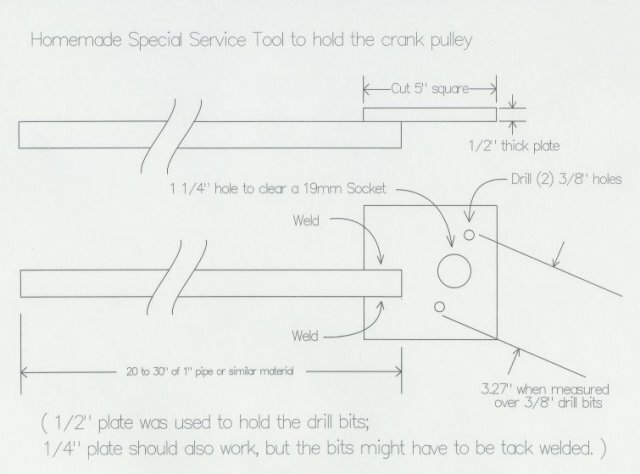 The FSM calls for a special service tool to hold the pulley while you loosen the bolt, but you may be able to make the tool yourself. We used 1/2" thick steel plate cut 5" square, then welded to a long bar for leverage. The pulley bolt takes a 19mm socket, so we cut a hole in the center of the plate to clear the socket, and drilled two 3/8" holes to fit the shank of two 3/8" drill bits. The pulley has two 3/8" holes in it, so if you space the two 3/8" drill bits 3.27" apart (measured to the outside of the drill bits), they will fit perfectly into the pulley holes. The camshaft pulley. The crankshaft pulley. 3/8" drill bits. The tool being used. The home made tool. Remove two bolts for the starter wire bracket, and four bolts for the cover. This looks like a large washer and it's on the crankshaft right in front of the timing belt. While removing this, note which side goes against the belt (the rounded or convex side). 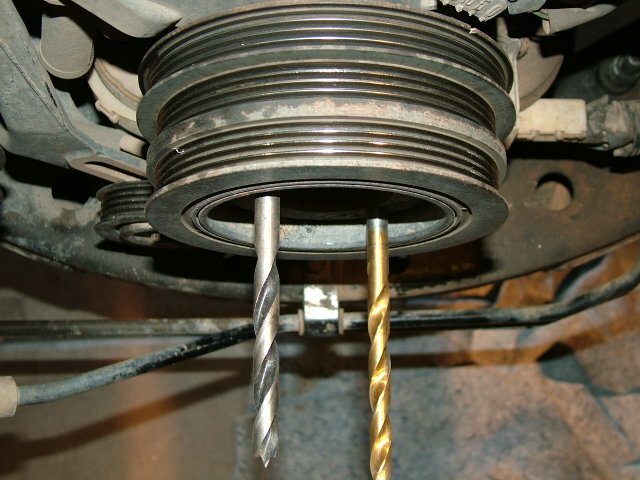 Temporarily install the crankshaft pulley bolt so the crankshaft may be rotated. 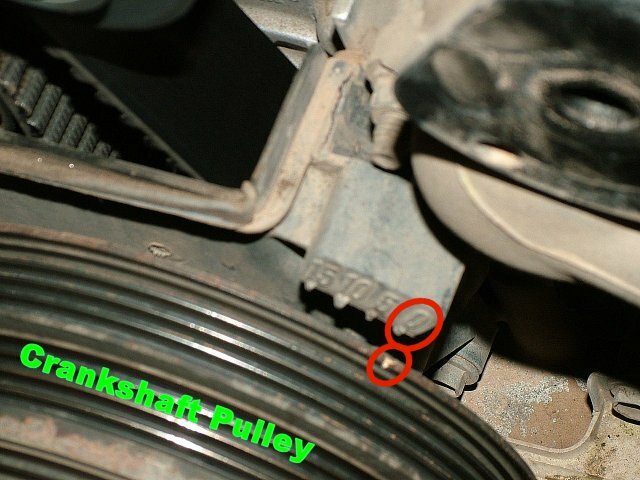 Turn the crankshaft (always clockwise) until it aligns with the mark behind it, and the two camshaft pulleys align with the marks behind them (on top). If the camshaft pulleys are not aligned, turn the crankshaft one more revolution. Remove the pulley bolt when finished. 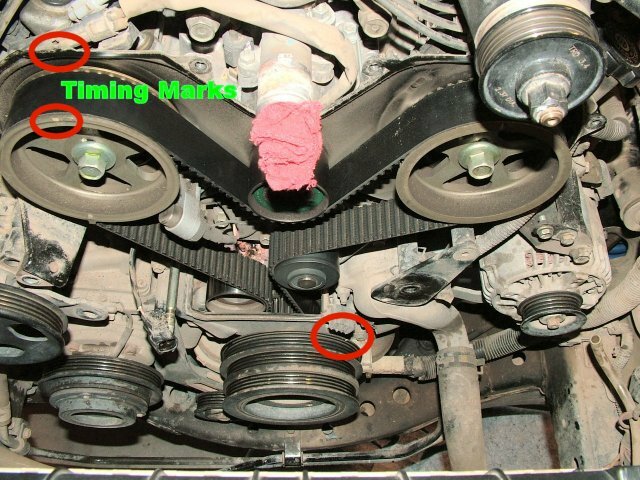 If you're using this article to get to the water pump, and will re-install the belt, make sure the marks (one at the crank, one on each camshaft pulley, and a mark to indicate the front of the belt) are present. If the marks are gone, be sure to apply new ones before removing the belt. Alternately loosen two bolts, remove them, the tensioner, and a dust boot. This step was omitted. We were replacing the belt, so the old one was just cut off. If you are reusing the belt, remove the top center pulley first to make the belt slack. This entire step can be omitted if you're using the Snap On Tensioner Compressor. The aftermarket tensioner compressor only works if the old belt is removed. Place the tool between the tensioner pulley and the water pump pulley. Turn the hex portion to spread the tool, which compresses the tensioner. Continue compressing it until the pin supplied with the tool goes through the hole in the tensioner. This pins the tensioner in the retracted position while the timing belt is installed (during assembly). After Step 19. The Snap On tool. The 'pin' retainer. A close-up. If the belt is still too tight, remove the top center (No. 2) idler pulley. We cut off the belt, so this step was already completed. This step can be omitted. Inspect the seal for leakage. This step can be omitted. Inspect and test the pulley bearing. Make sure that hole from removing the dipstick tube is covered, we don't want any coolant in there. Remove the thermostat housing, and then the water pump. The pump uses Form In Place Gasket (FIPG) material that may make it difficult to remove, be sure that any prying you do will not damage the gasket surface. Thoroughly clean the engine and thermostat housing surfaces with a razor blade/gasket scraper, then wipe these surfaces, and the new water pump, with an oil free solvent. Apply new Toyota FIPG (or equivalent) material and assemble within 5 minutes. The bead should be 2-3mm (.08-.12") wide, more material is NOT better! Torque the water pump bolts and the thermostat housing nuts to 14 ft. lbs. Take your time cleaning the gasket surfaces and adding new sealant. 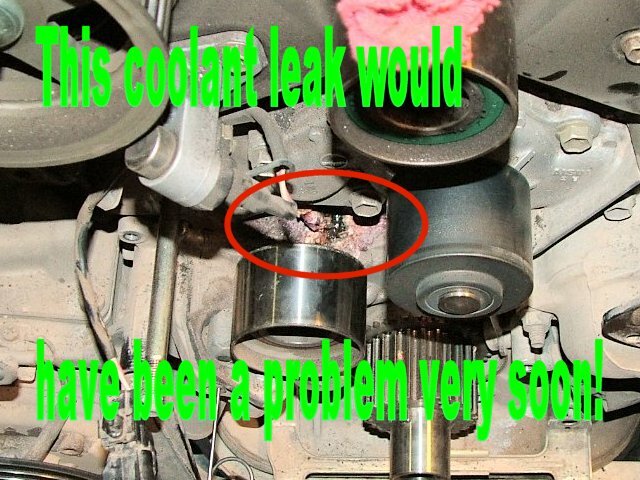 If it leaks, you will not only have to re-do all this hard work, Toyota also recommends that the timing belt be replaced if any coolant gets on it! Do not bend, twist, or turn the belt inside out. Do not let it come into contact with any oils or solvents. Visually inspect the belt for any separation, cracked teeth, or other damage/wear. If damage or unusual wear is found, check the belt guide, and the pulleys and gear teeth for nicks or misalignment. 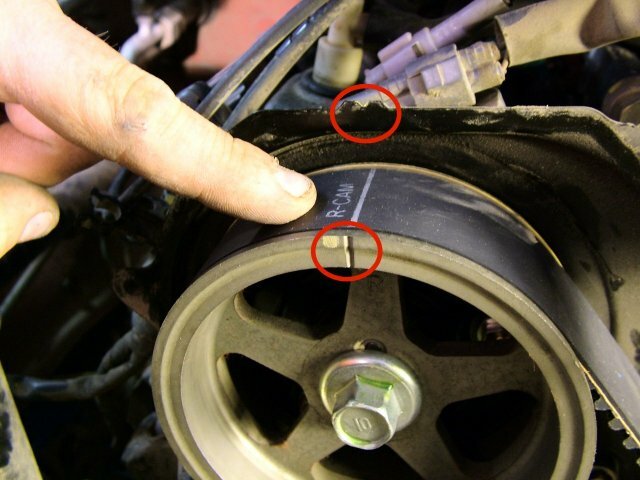 Even if replacing the belt, an inspection can also help to identify marginal components. For any oil leakage at the seal, and that they rotate freely without any roughness in the bearing. The tensioner assembly was not removed. If you removed it for some reason, torque the bolt to 26 ft. lbs. This was not removed. If you removed it, torque to 30 ft. lbs. Since the cam pulleys were not removed, the crank and cams should still be on their respective marks. Make sure all the pulleys are free of oil or water that might contaminate the belt. Note the marks on the belt, one for each cam, and one showing forward (an arrow). 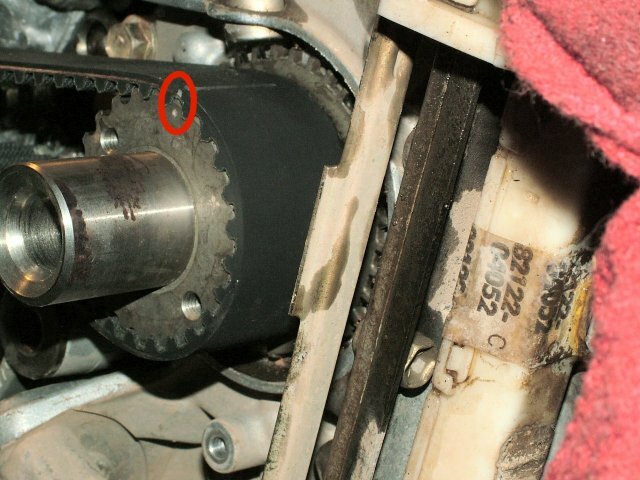 Pull the belt tight to simulate the tensioner (after it's released), and check the alignment marks on the two camshaft pulleys and at the top of the crankshaft gear. On this truck, the marks were just a tad bit off of the marks, but it was equal at all three marks (which is somewhat visible in the pictures). Crank timing mark. Crank belt mark. Cam timing marks. The tensioner was not removed, because the SnapOn tool was used. 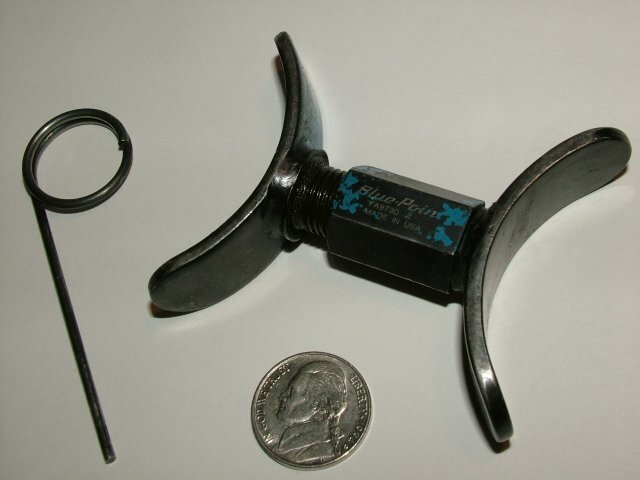 If you didn't have the special tool, the tensioner would be off the vehicle and this is where you would compress it in a vise and pin it with a small hex key or allen wrench. If you removed it. Now, once the belt is in place and ready for tension, put the pin out of the tensioner, and double check all the belt alignment marks. Nothing was removed, so the engine timing never changed. The cup side facing outward, smooth side towards the belt. Inspect the cover gasket to make sure it is still in usable condition. Torque on the cover bolts is a very slight 80 in. lbs. The Toyota FSM shows the crankshaft pulley bolt as a replacement item. We reused it on this truck. It's interesting to note that in the FSM timing belt illustration and text, the torque for the bolt is specified at 217 ft. lbs., but the illustration in the water pump section shows 184 ft. lbs. I found an earlier FSM that has 184 ft. lbs., so my guess is that somewhere between the T-100 model and the Tacoma, the torque was increased. This truck was torqued to 184 and hasn't had any problems. And the PS pump adjusting assembly. Make sure the o-ring is in place to seal the dipstick tube. Install the alternator adjusting bracket. Torque to 35 ft. lbs. We didn't remove this. Temporary because it's not torqued yet. We found it better to do the next step before this one. Which is the lower piece. We just installed the whole shroud before installing the fan. If you have the supercharger, follow the info in disassembly step number 7. Torque to a very slight 65 in. lbs. Install and adjust the belt. Torque to 18 ft. lbs. This was not removed, so it didn't have to be installed, but the belt had to be adjusted. Install and adjust the belt. Torque to 31 ft. lbs. Even with the numerous omitted steps and short cuts, this truck has been leak free and problem free for over three months.